Christianity Explored is a six-week series that takes you on a journey through the biography of Jesus (the book of Mark in the New Testament) to examine Jesus’ identity and purpose for coming to earth over 2,000 years ago. Using a challenging and entertaining lecture series by Rico Tice on DVD, followed by group interaction and discussion, you and others will examine three main questions that cut right to the heart of Christianity: Who is Jesus? Why did he come? What does it mean to follow him? 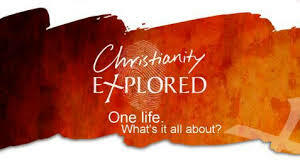 Christianity Explored gives you the time and space to think about the big questions we all ask and to explore the life of the greatest person who ever lived--and the one at the heart of the Christian faith--Jesus of Nazareth. There will be a $20 charge to cover the cost of the book and workbook--coffee and muffins will be provided each week.